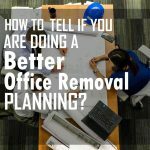 If you will not organise office removal well, you may cause untold trouble and stress to everyone involved in the relocation process. Hence, it doesn’t have to be that way if you have a plan and organise your move ahead of time. Planning and organising play an important role in a smooth relocation transition. Yes, you don’t need to be stress. All you have to do is to know how to organise office removal for a smooth relocation. 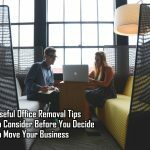 And for you to do that, follow these five useful tips on how to organise office removal for a smooth relocation of your business. Planning is the crucial part when it comes to moving your business. Yes, a well-planned move gives you the advantage to check and review the things you are about to do as you move your business. It could help make your move as cost effective as plan. All you need to do is to consider the things that need to be considered. Failing to plan makes your move much harder than usual and unsuccessful. So, know the pros and cons of your move and draw a step-by-step plan to make it as your advancement. When you organise office removal, it helps prevent business downtime that could cost you money loss. As you have successfully planned and organise your office removal, consider hiring professional office removalists. These professionals will help you out as you carry on your plan for your removals. Hence, as you look for professional movers, make sure to check and evaluate the reputation of the moving company you are about to hire. Yes, there are many removal companies that you can find that will say they can do the job at a cheaper price than their competitors. However, you need to bear in mind that not all the cheapest option is always the best choice. Take time to research and check their credibility before considering them. Always get at least 3 quotes for your reference. Remember that a reliable removal company will always provide you with the best quote depending on your service’s needs. Before you move you should draw up a floor plan for your new office. This will help you avoid unnecessary problems on the day of your move. You need to draw up the best use of your new space for your business. Organise all your employees and office equipment well. Your chosen removal company should be able to help you prepare a new floor plan. So, on the day of the move, everything will end up in its proper place. Also, use labels on the floor plan to help guide the removers during unloading your stuff. Organise office removal with your team. Letting them get involved in your in the task makes them feel important and appreciated. This will not only add to their motivation to help the move. But it will also cause active participation to lighten stress to the employees. You can ask various staff members about their insights on how to organise your new workplace and it will help make your new place a comfortable working space environment. As you move to your new office location, you should make the most of your space. For some instance, there might be certain items that you don’t need to use every day but you don’t want to get rid of. You can consider renting business storage facilities. You can use it to keep those items. Your chosen removal company should be able to arrange or even recommend a self storage unit for you. By this, you don’t need another extra time to look for a storage unit that you can use to store your items. Moving your business can be a fantastic chance for you to renew your business. Thus, lifting your staffs’ morale as well as its productivity. Take the advantage of all the resources available and ensure your office relocations success. An organise office removal leads you to a successful and stress-free office move. Take time and ask some professional for an office moving services that may fit your needs and business requirements. Still need more advice on how to organise a smooth office move? Visit our blog section and read more useful advice that can help you out. And if you plan to move your warehouse, then check this recommended article → Office Removal Tips to help you out.